Last weekend artworks produced by students from across the Range were on show at the Maleny High School Activities Centre. The occasion was the 15th Maleny Apex Young Artists Award. 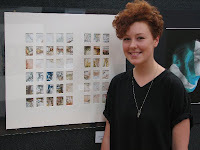 Maleny High School senior student Freda Davies - winner of the senior painting prize - with her painting Desert Poems. Organisers this year were delighted with a record number of entries by budding young artists from the hinterland districts, confirming that this annual event is now firmly established as a most important cultural event. Maleny Apex must again be thanked and congratulated for sponsoring this award and for supplying the man-power needed setting up the exhibition screens. In opening the show Apex Vice President Steve Skull congratulated the students for such a high standard of work and thanked the Maleny community for supporting Apex fund raising efforts that made possible the sponsorship of events such as the Art Awards. This year the art teachers and senior students from Maleny High worked together in hanging the artworks and members of COMA manned the information desk over the two day exhibition. 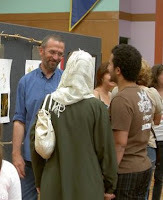 Ken chatting with overseas visitors at the YAA Exhibition - now therein lies a story !! !